With only a few more weeks until NAFSA 2018, many of us are finalizing schedules, setting up meeting arrangements, and booking reservations. While your conference planning is underway, don’t forget to save some time to explore Philadelphia with colleagues old and new. No need to dive into a guide book or scroll through Google, below are tons of happy hour recommendations and fun things to do while visiting the City of Brotherly Love. 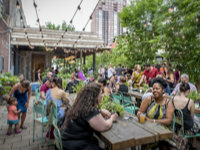 Whether relaxing after a long day of sessions or networking with new connections, everyone loves a good happy hour, and Philly is no exception! Offering everything from upscale cocktails to local craft beers, traditional bars are not the only place you can grab a quick drink. Some of the best venues are those that are unexpected. If you really want to live like a local, ask about the “Citywide Special,” a famous shot and beer combo in Philly that usually includes a can of low cost beer like Pabst Blue Ribbon and a shot of whiskey like Jim Bean for $3-5 dollars. There is always something on in Philly, especially as we move into the summer months. Outdoor festivals, street fairs and live entertainment keep locals busy and active. Most of these below events are Philly traditions and luckily are scheduled around the NAFSA Conference and Expo. Chinese Lantern Festival - Massive Lanterns in all shapes and sizes held in Franklin Square. Franklin Square Park - Mini Golf, a Carousel and a Burger Stand with a Tastykake flavored milkshake! The Roots Picnic (June 2nd) - The Roots, a Philly favorite band host their annual concert. Spruce Street Harbor Park - Beer Garden, Arcade, boardwalk, floating restaurant all in one! Schuykill River Trail - Run, Walk or Bike the Schuykill River. First Fridays - Open art galleries in Old City the first Friday of every month. First Sundays - Pay what you wish at many Philadelphia museums the first Sunday of every month.